A Hollins education ignites the strength within you and prepares you for a future filled with achievement and purpose. Type of School: Hollins is a fully accredited private liberal arts university founded in 1842. The nationally acclaimed institution provides exceptional academics, real-world experiences, and leadership programs that prepare students to be achievers in life. Size of Campus: The University is situated on 475 pastoral acres in a suburban area within 15 minutes of downtown Roanoke, Virginia. Campus is a welcoming, safe environment where students are supported and challenged. Location: Hollins University’s beautiful residential campus is located in Roanoke, Virginia, a vibrant, medium-sized metro area with a population exceeding 250,000. Roanoke is the commercial and cultural hub of Southwest Virginia. The city offers an abundance of activities year-round, including festivals, shopping, restaurants, outdoor recreation, arts, theatre, and area attractions. Major US cities are an easy drive from campus, and the airport is just 10 minutes away. Number of Students: There are 645 undergraduate women and 145 co-ed graduate students. Number of Faculty: There are 70 full-time faculty members. Ninety-seven percent of professors have achieved the highest degree in their field. The student-faculty ratio is 10:1, and the average class size is 11. 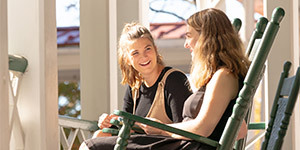 Majors and Programs: Hollins offers 28 majors in the liberal arts and sciences for undergraduate students, as well as pre-professional programs. The University also offers 11 graduate degree programs and certificates. Geographic Diversity: Hollins students come from 38 US states and 21 countries. Financial Aid: Extensive scholarships, grants, and personalized financial assistance put your quality education within reach. 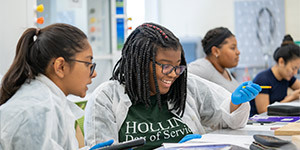 Ninety-nine percent of students receive scholarships and financial support from Hollins, and $24 million is awarded annually in scholarships and financial aid. First-year students receive a minimum of $23,000 in aid per year. Test Score Requirements: Average test scores are 1188 for the SAT and 26 for the ACT. of students are employed or in grad school within one year of graduating from Hollins. of students complete at least one internship as part of their Hollins education. is the number of years Hollins has educated students to lead lives of success and service. At Hollins, you define your goals and build a comprehensive, life-changing plan to get there. From your first class to your last debate, you’ll be challenged with new ideas, pushed to do your best work, and encouraged to take charge. 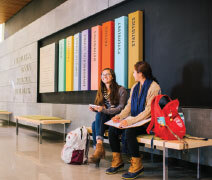 Hollins offers demanding curricula in 28 majors that range from the sciences and Business to International Studies and Creative Writing programs. Small classes, distinguished faculty, hands-on research, and student-faculty collaboration create a stimulating academic environment that prepares you for success. As evidence of the power of our academics, 95% of Hollins students are employed or in graduate school within one year of graduation. Our students are accepted to prestigious graduate schools, including Duke University, Johns Hopkins University, Harvard University, Marquette University, New York University, University of Pennsylvania, University College London, Washington and Lee, and many others. Internships: At Hollins, you have the opportunity to gain early career experience through exciting internships in your area of interest. Beginning your first year, you can put theory into practice as an intern at a hospital, media company, national museum, international business, medical association, law firm, or nonprofit organization. Our signature internships even provide students housing and a $300 stipend in support of your internship experience. Study abroad: More than half of Hollins students participate in international study programs. With your scholarship funding following you and additional scholarships available, our programs and affiliates offer students an approachable, equitable process to navigate study abroad. You will expand your world-view and enrich your education. Batten Leadership Institute: Our distinctive leadership programs help you grow as an individual and build confidence in and out of the classroom. Whether you wish to influence from the middle or lead the charge, you will learn how to become more self-reliant and effective in all types of situations. Surrounded by majestic mountains, the beautiful Hollins campus is a welcoming place to live, study, and make lifelong friendships. Here you’ll find diverse cultures and ideas to grow as an individual and pursue your dreams. People respect and appreciate each other here. They care too. On an ongoing basis, you’ll engage with faculty and staff members who take special interest in what you want to accomplish. You’ll also share your experiences and make memories with a network of friends that feel like extended family. In your free time, you’ll find lots of fun things to do on campus with uni-que Hollins traditions, special events, and zany activities. You’ll also have the opportunity to participate in athletics, clubs, and organizations that appeal to your interests. Plus, Hollins is located minutes away from Roanoke’s vibrant downtown scene, full of restaurants, shops, coffeehouses, festivals, events, and more. Our students benefit from a global alumnae network that opens doors to internships, careers, and connections that last a lifetime. For generations, Hollins alumnae have taken students under their wings and assisted them on their path to success. Alumnae mentor students on career options, host events to promote interest in job opportunities, and make introductions with key influencers that lead to successful careers. And in many cases, our alumnae are the key influencers. Hollins alumnae have a long history of outstanding achievement in their careers and lives. They can be found leading corporations—and at the top of their fields in medical and veterinary medicine. They are Pulitzer Prize–winning writers and acclaimed artists and photographers. They are researchers, media producers, jewelry designers, asset managers, entrepreneurs, lawyers, and professors. Most important, they enable Hollins students to walk in their footsteps of achievement.